You claim it is "odd," the plane, "...flew way out of the way up over Greenland and back down through northern Canada." Then claim, "...flat earth flight rules..." dictated, "...a straight shot West." Funny, all one needs to do is pull up Gleason's Azimuthal and see that is exactly what they did in flying over Greenland and Canada. What’s hilarious is that your claiming FE victory referencing a globe earth. You do realize the Gleason map is a globe projection?As in, you know, derived from a spherical earth. The irony is that FE uses globe maps. Kills me every time. The globe is merely the extrusion of the azimuthal. All maps, from the dawn of time, have been drawn on flat paper based on the person doing the drawing being on a flat earth plain. If someone draws a portrait of you does that then mean you are flat? Do you normally make up false equivalencies? the point I was trying to make was that just because because someone drew a map on a flat sheet of paper doesn't mean the land is also flat. Mapping out something from a bird's eye view isn't the same as mapping out a 2D object. They didn't draw a flat map because it was flat land. A flat map and the land they are on aren't the same thing and one doesn't mean the other. Do you always assume something is the way it is because of someone's interpretation? Is Picasso's later paintings accurate to reality simply because that's how he painted it? If I had minimal resources and knowledge right now and about to draw a map of my local land I wouldn't start carving a tiny map out of a giant sphere because that would be impractical and harder to do than say, scratching directions onto the surface of something or anything. A wall in a cave, dirt on the ground, carving into a tree. Any surface really, no need for my local land to be mapped out on a sphere as that has no benefits to me in this case. Maps aren't drawn on a flat surface because of a flat earth and that shouldn't be an example of flat earth. The same as how we have flat maps of stars/planets yet we know that stars and planets are up in the sky in a 3D space (whether you think it's on a dome, planets in actual space or whatever). Your statement that maps are flat because the world is flat is just incorrect. Unless I've misunderstood your meaning? In which case feel free to correct me here. Wrong, find out about projection.. Clearly you really know about it from geography at school. As per usual, incorrect. Long haul airline pilots and ship captains take the shortest route between two points and that is called a straight line, on a globe it is technically referred to as a 'great circle'. In case you are unaware what a great circle is, it's defined by the air, sea travel/navigation industry worldwide as: A circle on the surface of a sphere which lies in a plane passing through the sphere's center. As it represents the shortest distance between any two points on a sphere, a great circle of the earth is the preferred route taken by a ship or aircraft. If you have a problem with the way all global travel/transport/navigation is carried out using the globe earth model I'd suggest you take it up with the folks who run, maintain and carry out all global travel/transport/navigation. I don't believe your "better way of doing things" notions are reaching the correct audience by posting here. Well if all you see during the entire flight is ocean out the windows then you have an idea of the path that it didn't take. This corroborates pretty much every shipping boat that's traveled between these two nations. You travel west from LA to get to Japan and you travel East from Japan to get to LA. This flight path says that Tokyo is north, then south of LA. This flight path takes you north up the west coast, over Alaska, over parts of Russia. Based on the direction of travel, and not seeing Alaska and Russia out of the window I would venture to say this flight path is not the one people are taking between LA and Japan. I disagree with this. Google has drawn a map on an interactive sphere. based on the person doing the drawing being on a flat earth plain. First paper is a 2d medium. Anything that goes on paper is considered 2d. If someone wanted to make a 3d map they would have to sculpt it, 3d print it, or make some sort of globe. Secondly I could paint "continents" on a basketball then draw a map of it. I think you can have a 2d map and a 2d surface or a 2d map and a 3d surface. I looked at a map of Colorado 2d but I can assure you Colorado is very mountainous and is not a flat 2d plane. Completely agree. If you decided to do some long distance walking in Nepal and took a map with you, you really shouldn't be surprised to find the ground is anything but flat and climbing gear and oxygen is required in places. Just because the map is literally flat, doesn't mean the ground it depicts is literally flat - it's just a representation in a 2D format, much more convenient than any other format. You could just as well take a basketball and project it to a flat surface using any map projection you like - North Polar Azimuthal Equidistant (i.e. the beloved AE projection), Bi-polar, Mercator, Transverse Mercator, you name it. Doesn't make the basketball flat does it. I have a very simple question. If the earth is truly flat, has no roundness whatsoever (EXCL. Mountains, Lakes, Oceans etc. ), then how can flights in the Southern hemisphere take the same amount of time as in the Northen hemisphere. I have included screenshots of the plane tickets with time, drawn out distance lines on RE map and also on the FE map. The only differences between two of the maps is that one of the lines on the FE map is more than twice as long (green) than the other one (red). If the earth is truly flat, then these flights, that are being sold, are not possible and one of them would take at least twice as long. Thanks for the reply in advance! Here is a list to all of the answers for a flat disk model. mapqust is based on openstreetmap which uses a round earth WGS84 model. Look at https://www.flightradar24.com/data/flights/qf28 for direct flights. 13hours. regardlesss of what the map is based on it represents the earth at a flat plane. 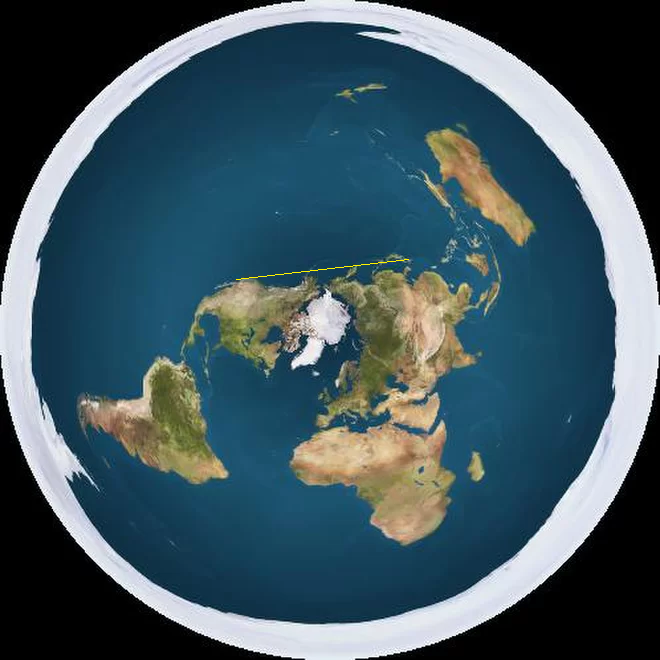 I'm using that projection of the earth as a flat plane as the basis for a alternate flat earth models. google maps represents the earth as a sphere. All maps we use have an underlying grid of latitude and longidtude of the round earth. They also fly on different bearings, too, and, on the flat earth model, over recognisable landmasses instead of ocean and ice. Last time I checked there were 80+ direct southern hemisphere flights every week. For the conundrum, Melbourne, Sydney and Auckland to Santiago, and Auckland to Buenos Aires are probably the most relevant ones. Ships ought to be taken into consideration too, since their routes are perhaps even more difficult to explain. marinetraffic.com is a ship tracking site similar to the flight tracking ones where you can look at southern hemisphere ships and see where they're going/where they've been. Reality is that the earth is a sphere. Look at flights from Perth to Capetown.